Traveling full time in our RV brings adventure, photo safaris, “tired-puppy” days, breathtaking scenery, gut-splitting laughter, “think-out-of-the-box” opportunities and a chance to experience new places for days, weeks, or months…..
Best of all, it brings us together with family, friends, friends-of-friends, new acquaintances and all of you riding along with us on our blog. So, we thought it would be fun to start a “Guest Book” dedicated to our encounters on the road. I only wish we had thought of this sooner! We’ll update this post after each new encounter. Thank you all for your support, encouragement, following us on our blog and meeting up with us on OUR road! Last August Greg’s sister, Janet, visited us in Yellowstone for a week. We had a fabulous time and were thrilled when she decided to return this year. “This time”, we vowed, “we’ll find a bear for her!”. Day one yielded very few animal sightings so we took extreme measures the next day. With a 4AM wakeup, we ventured into the Tetons. To our delight we not only found a young black bear foraging in the forest near the road but also a mama moose and her baby munching in the the willows. What a thrill to see Janet’s happy face taking it all in! 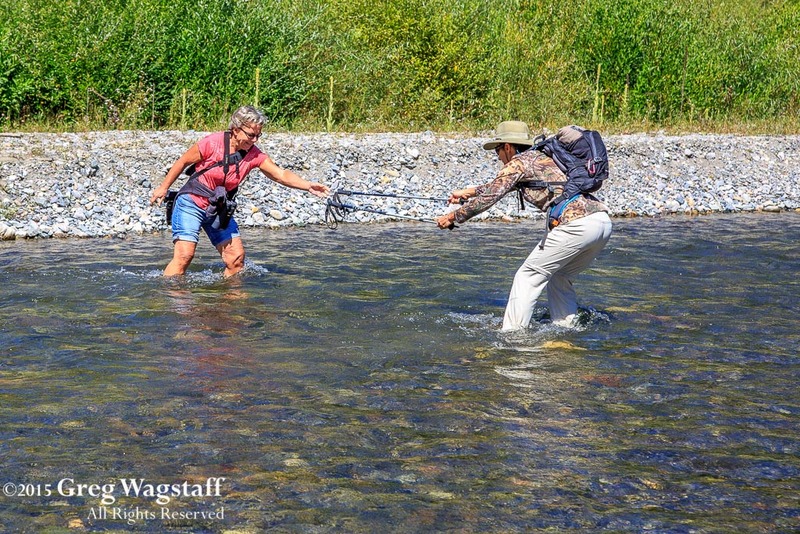 Thank you Sis for adventuring with us, sloshing through mud to soar with eagles and braving an icy, slippery creek crossing! How do you catch up with a good friend you haven’t seen in… well, let’s say a few decades? Simple. You just pick up where you left off. 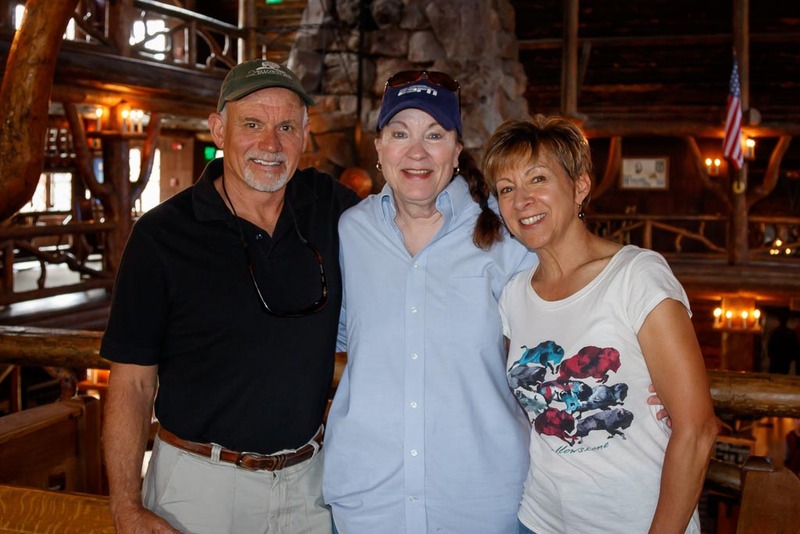 What a treat to reconnect with Peggy Kalish on a sunny, relaxing morning at Old Faithful Inn. And a special thanks to PK’s niece, Krystal, who patiently accompanied us through a whirlwind memory jog from Campus Life days to the present. Peggy, you continue to inspire us and we are so grateful for your time! 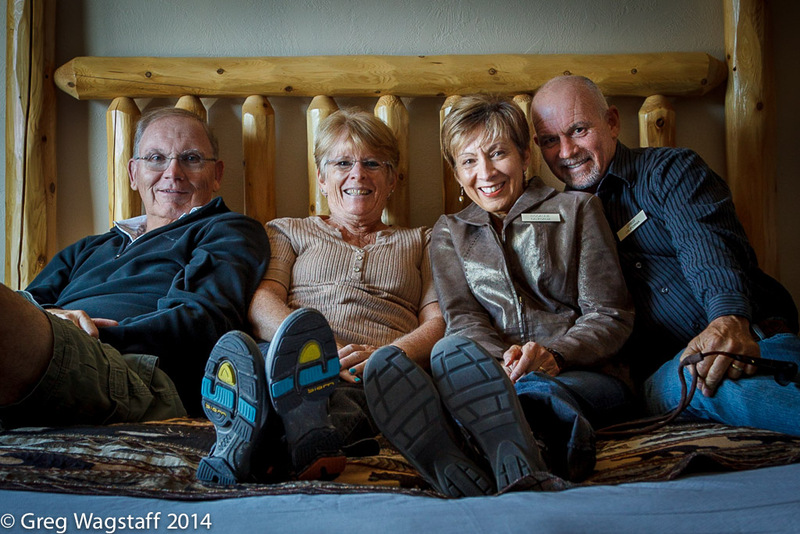 For all the time we spent in West Yellowstone, it seemed odd we hadn’t run into anyone we knew. Until, one evening Greg noticed a post on FaceBook. “ChaCha’s in town?”, he questioned. A series of texts later confirmed she was. This proved to be a real “run-in”! 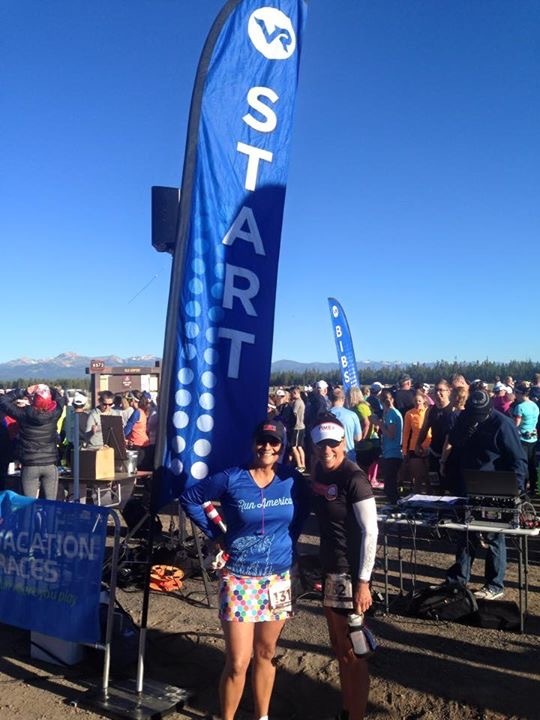 You see, Chacha and Bea, friends and Greg’s former co-workers, ran a half-marathon sponsored by VacationRaces.com in West Yellowstone! Dinner and drinks at the Buffalo Bar the next evening made a perfect finish. Congratulations on your race ladies! We enjoyed spending time with you. Family times are the best! And sharing a place we love with those we love creates cherished memories. 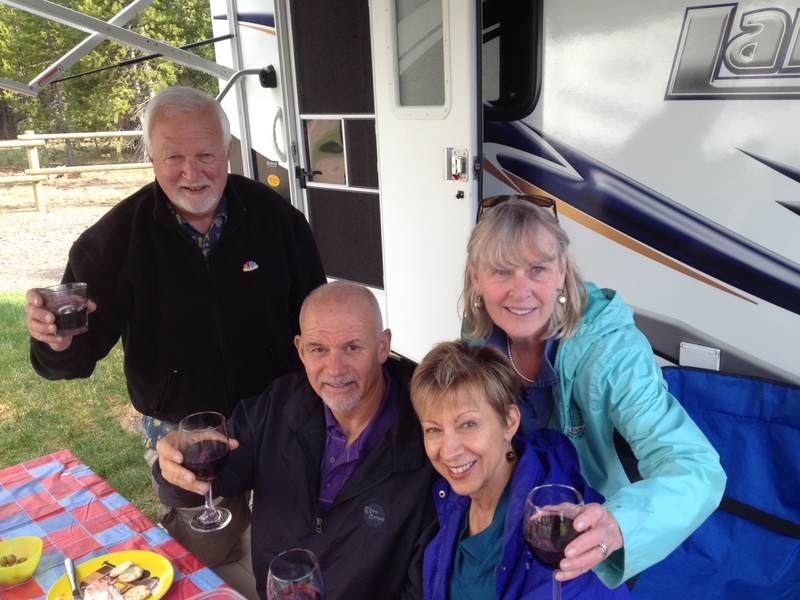 Donna, Sharon and I laughed and reminisced about our first family RV trip to Yellowstone 42 years ago. Nine of us crammed into a large camper suitable for four! And here we were again, but this time, in larger, more spacious RV’s. (See “Back to the Future” post). Greg, the ultimate tour guide, planned each day’s excursion perfectly and Mike even got some fishing time in. 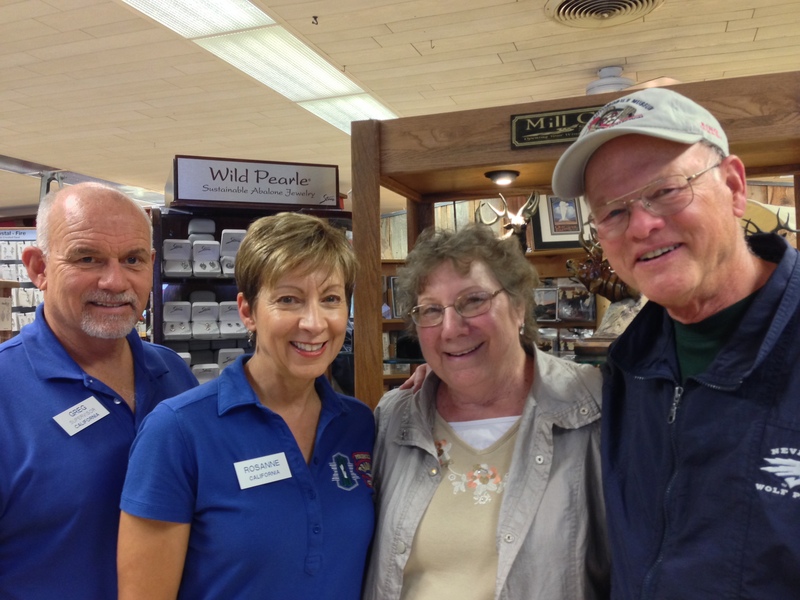 Thank you Donna, Mike and Sharon for meeting up with us on the road. 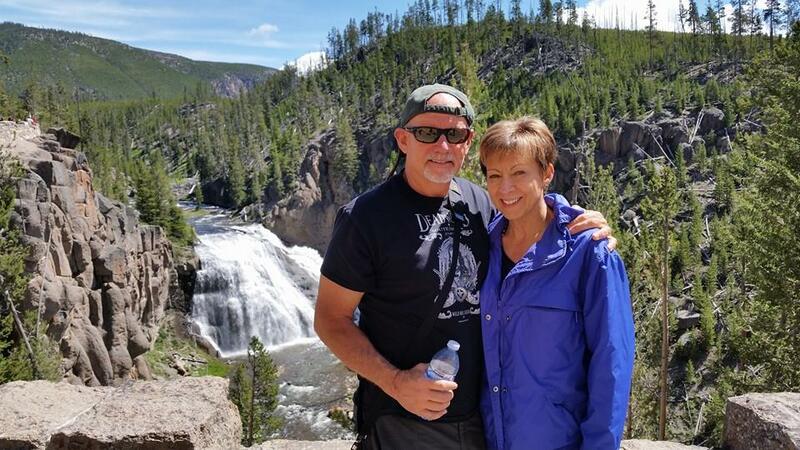 The moose, bears, storybook hike, geyser basin drama, and rainbow on the Lower Falls are merely a backdrop to the best part – spending time with you! It’s always a delight when friends’ travel routes connect with ours! And we appreciate any bit of time we can spend together. Thank you Dave and Terrie for sharing your adventures with us. We loved hearing about your daily explorations. It was the highlight of our “minding the store” days! We look forward to seeing you in Moab! 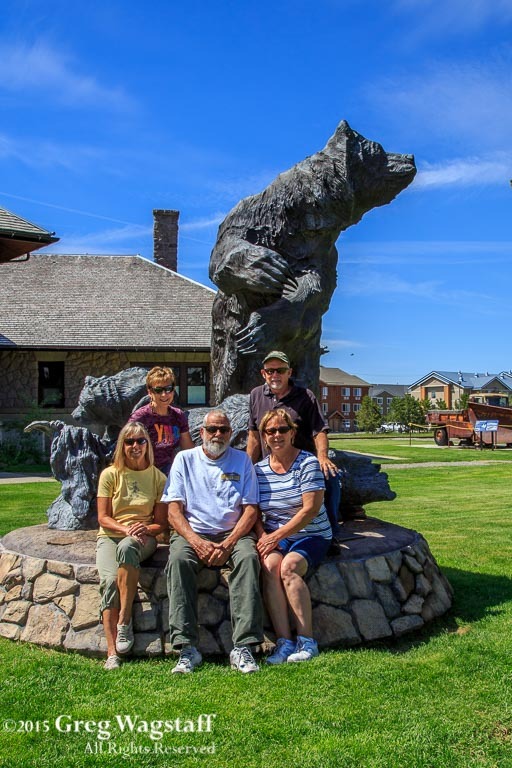 When we heard Sue and Val would be in “our town” of West Yellowstone, MT touring the park with their cousins from England, we hoped we would get a chance to see them. Thank you for stopping by to say hi and catch up. We know how busy vacationing and touring Yellowstone is! So glad you had a wonderful trip. 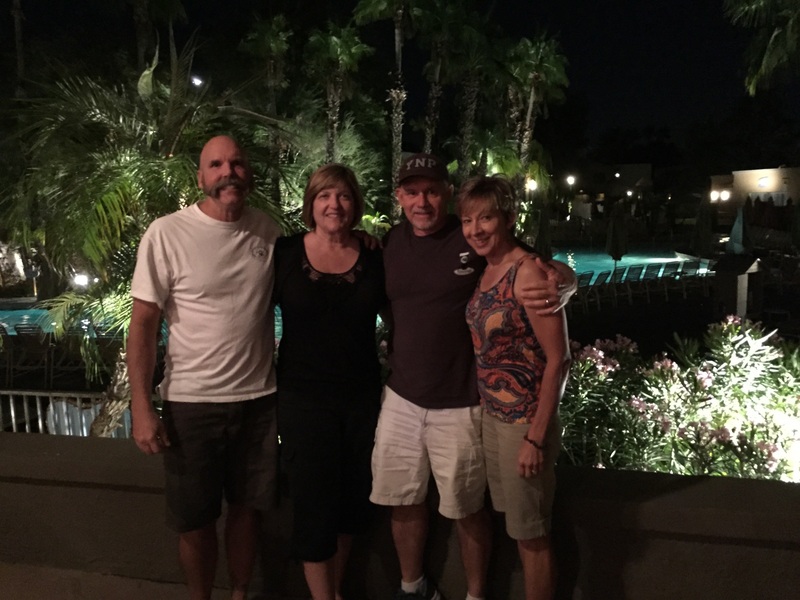 Thank you Debbie & Mike for meeting up with us in sunny Phoenix, AZ… even though we heard the palm tree lined resort pool with its waterslide calling your names! Loved having you to ourselves and catching up over happy hour and dinner. Very special time! 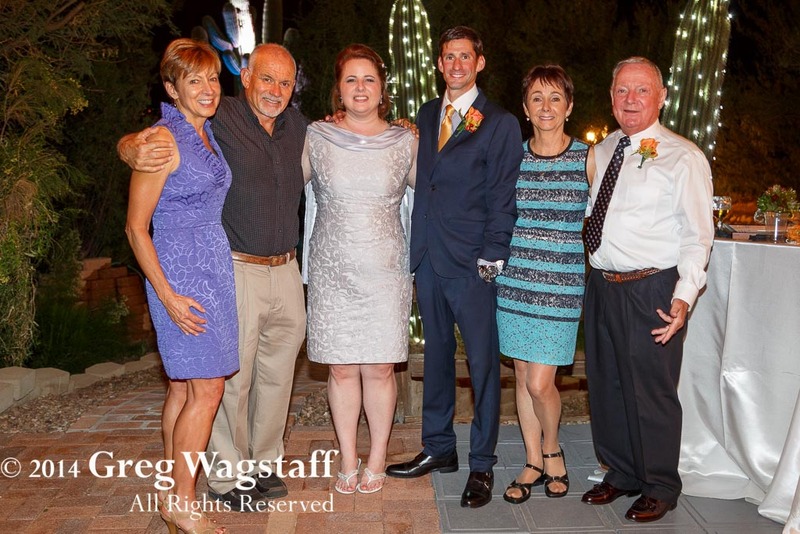 What a pleasure meeting up with long time friends Vic & Deb at their daughter Juli’s wedding! It felt like a reunion, seeing long lost friends and meeting new friends whom we heard so much about over the years. Beautiful wedding, gorgeous venue, and perfect intimate-sized crowd! Congratulations Juli & John! We wish you many happy years together. Thank you for sharing your special day with us! 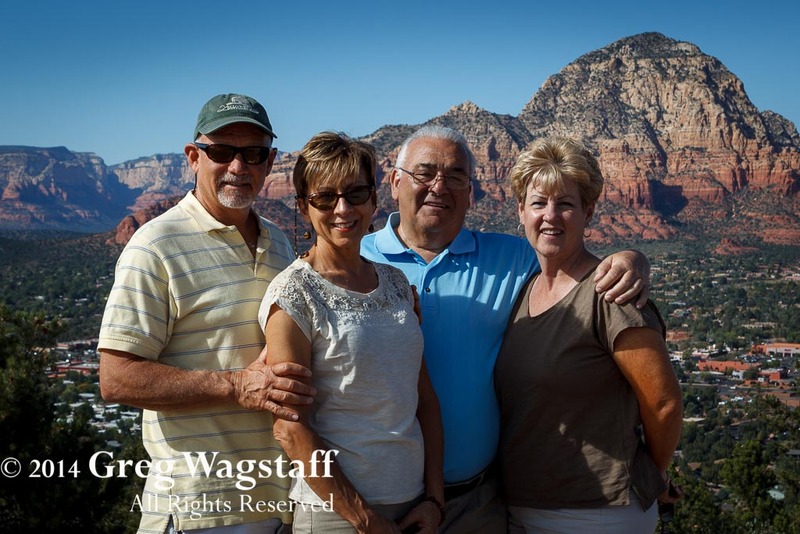 It felt like old times when our dear friends Nancy & Gerry Sarmento visited us in the Phoenix area! Had a wonderful time visiting, toasting AZ sunsets, and cheering the Giants into the World Series. Enjoyed Sedona’s spectacular fiery red rock landscape, shops and historic Chapel of the Holy Cross perched atop the buttes. All too soon, our visit was over. Thank you for spending time with us and creating special memories. When we heard the Nevada gang was headed for Utah along our route to Arizona, we couldn’t help but crash the party! Had a wonderful time ATV’ing (see October 29, 2014 post) and truly enjoyed spending time together! 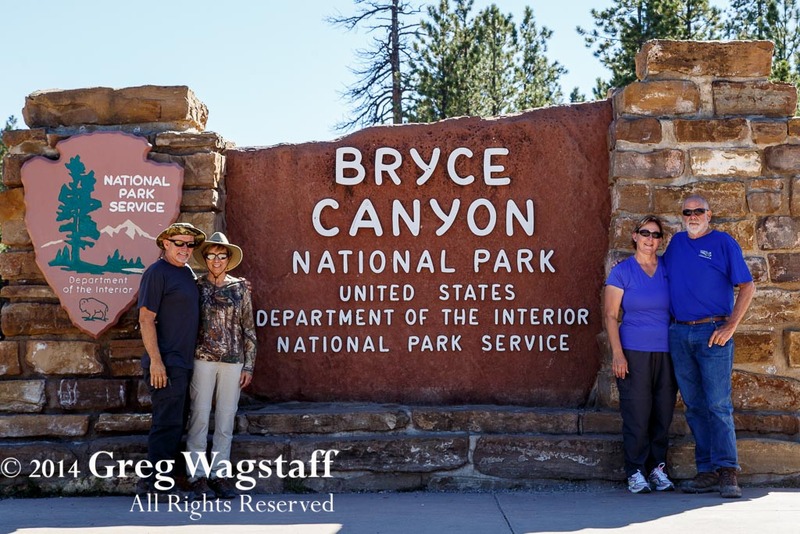 Our day trip to Bryce Canyon with Sharon & Mike was like a foggy trip down memory lane as we each tried to retrace steps from our past visits many years ago. Oh well, a little extra hiking in the beautiful red rock vistas and sharing this trip with them will always be treasured. Thank you Sharon & Mike, Dave & Terrie, and Bob & Debbie! Thank you for braving that teeny plane and flying into West Yellowstone’s one-counter, one-gate airport! So enjoyed spending time together, adventuring in the park, searching for bears (they really do exist in the wild! ), and watching/hearing the Bison Rut – bulls growling, grunting, pawing the dirt, charging, chasing each other and almost running into our car! Not to mention our “spelunking” at the Lewis & Clark Caverns. Fun times and very special memories! We need to plan our next adventure together soon, Sis! Is the Park Ready for Us? Had a wonderful time with my Sis and her family! 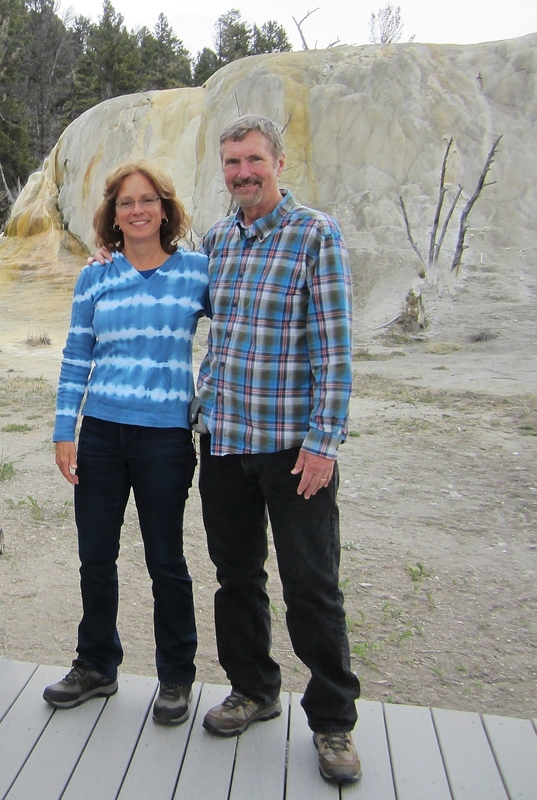 Loved spending time together, exploring the park and getting a fresh, new perspective on YNP, especially the “thermal features” (geysers, mud pots, hot springs) and Junior Ranger program – great job Colin & Leia! So happy wildlife showed up in full force….Mama bear & 3 cubs, solo black bear, bison (herds, jams, parades, lone sprinter rounding the corner towards our car), bald eagle, and a six-point bull elk! Thank you for traveling over 1,000 miles from CA to visit! Missed you the day you left! Special times with the Schenck family! Explored Yellowstone together over two full days. Saw two sets of Mama bears with cubs, velvet antlered elk, bison herds, bald eagle, Old Faithful, Yellowstone’s Grand Canyon and dramatic waterfalls. Best of all, we spent time together! 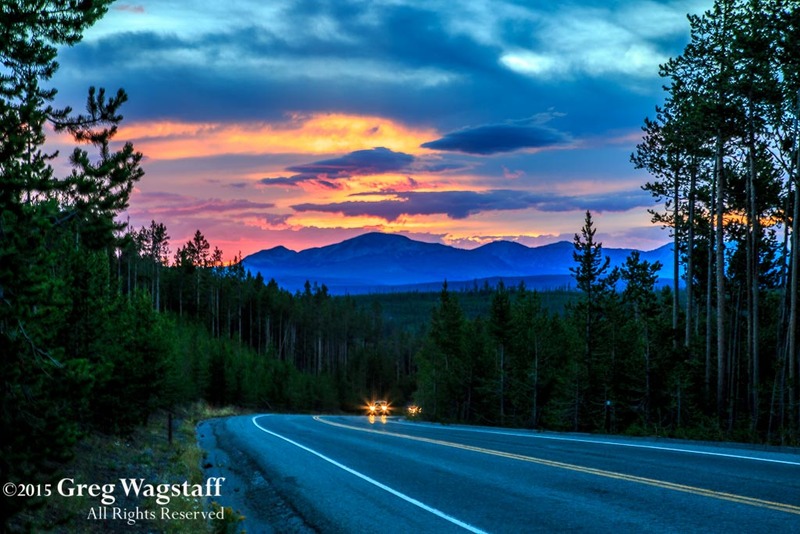 Thank you Joe, Michelle, and Tyler for routing through West Yellowstone, MT enroute to Wisconsin! Photos compliments of Michelle. Thanks for taking a 1,050 mile road trip to visit us in Yellowstone! We had a wonderful time playing in the park with you two and visiting the Grizzly and Wolf Discovery Center! Not to mention “happy hours” and dinners together. Very, very special times! Thank you. So good to see you on your way to Colorado. Wish we had more time together but really appreciate you coming to West Yellowstone despite your tight travel schedule…it meant a lot to us! Glad we got a quick snapshot! Looking forward to seeing you in AZ this fall. Great meeting you two and a big thank you to Karen Degney for introducing us via e-mail! When we received Karen’s message we knew we just had to meet you. Loved exchanging travel tales and so happy our paths crossed. Thank you for your hospitality!